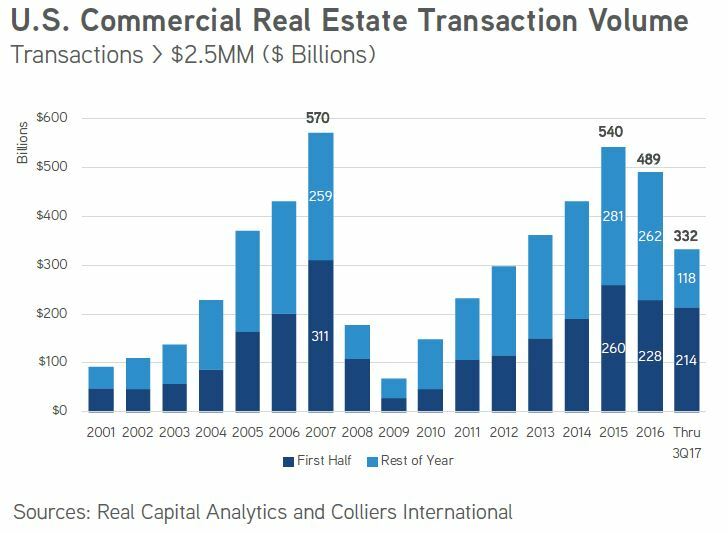 2017 and the first quarter of 2018 has been a great time to be in commercial real estate. 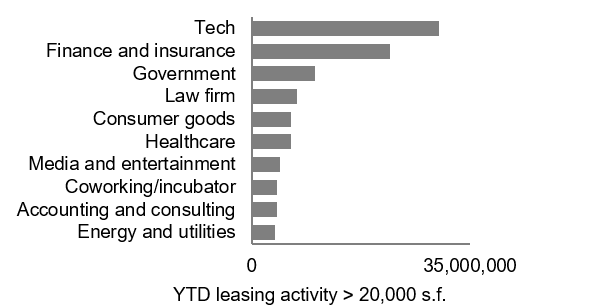 Transaction volume in 2017, according to CoStar, was over $500 billion – down 15% YOY (see chart below). This volume however, is above that achieved in 2006, which was a stellar year. Industrial, multifamily, data centers, self-storage have all performed well. Despite the “Retail Apocalypse” headlines over the last year and a half, retail overall has not performed as bad as these headlines suggest. Commercial real estate performance in 2018 is expected to be similar to that of 2017. Let’s break it down. I know better than to predict where we are in the real estate cycle, but I will recap where we are and what the current trends indicate about the future. Take it with a grain of salt, because I will likely be wrong. In short, we are approaching the end of this expansion. All cycles must go up and down and every strong run must end with a correction. I am not expecting a complete collapse as was seen during the Great Recession; however, in the near future we are due for a correction to resolve the impending pricing imbalance. We recently saw this phenomenon take place in the equity markets. The primary reason for which I believe the next contraction will be much less severe than that of 2008 is because real estate professionals, across all areas of the business, have been operating under a much more risk-averse strategy – protecting themselves against the downside risk scenarios much more than in cycles past. Overall, supply and demand are in a very good balance. We aren’t seeing absurd levels of new development. The majority of new development is focused on multifamily, yet despite the additional inventory, most markets are struggling with insufficient housing supply. We aren’t seeing that late cycle optimism we’ve seen in past cycles. The primary motivator of this more risk verse behavior, is in large part due to the consequences of the Great Recession, that although nearly 10 years past, is still vivid in our minds. The lack of late cycle optimism is one of the reasons I predict a slow-down rather than a collapse. Everyone is chasing yield, as they always do, but most are being very cautious about taking on too much risk. As we learned in economics class, the average business cycle lasts about 7 years and the average commercial real estate cycle lasts a bit longer – averaging 10 years. History has also demonstrated that cycles are gradually lengthening in time from peak to trough. It’s easy to notice that the stock market is overvalued, unemployment is at a record low, and real estate prices are at or above their 2007 peak (see chart below). It’s no wonder most predict a we are in the late innings of the cycle. • Real estate experts, particularly those that have been through a few downturns, are moving forward cautiously. There are no major red flags indicating that a recession will occur in 2018, but, given the length of the current cycle, the extended length of time interest rates have been low, and the fact that the Fed will continue to raise rates – we must admit we are in the late innings of this cycle. • Cap rates are expected to rise in conjunction with the rise of interest rates. • Demand is likely going to continue to exceed supply in most property types (excluding retail & malls). • Still a great demand of capital chasing core real estate in gateway cities from both domestic and foreign investors. The Southwest and Southeast are the most promising geographic areas in the US due to the migration of people to these areas from the Northeast and Rust Belt. Despite the perception that all of these people have put working behind them, many of these individuals, however, are young and well-educated workers who will strengthen the economy. According to Emerging Trends in Real Estate 2018, by PWC and ULI. The selections were based on extensive interviews and surveys of over 800 commercial real estate professionals in the United States. I was particularly interested to see that Seattle and Salt Lake City made it near the top. I was somewhat surprised to see Fort Lauderdale and Los Angeles in the top ten. Retail is changing at a fastest pace since the introduction of the mall in the 1950’s. E-commerce, demographic changes, and changing consumer behavior has set in motion trends that nobody would have predicted even 5 years ago. With rapid change in any industry, there will be winners and losers. The Darwinian nature of retail continues, as it always has, albeit at a much faster pace. 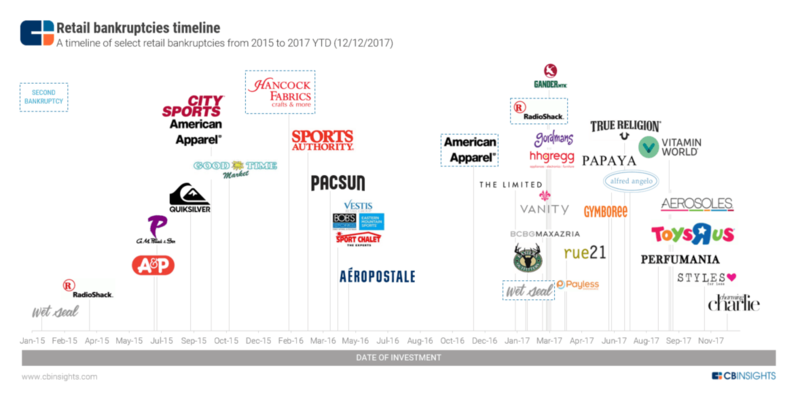 We’ve all seen the “Retail Apocalypse” headlines, but in reality, retail is not dead – its evolving. Experiential retail is a relatively new concept that caters to the change in demographics and consumer behavior. It is interesting to note that Class A malls with great amenities are doing better than ever; however, class C & D malls now look more like a cemetery than go-to spot for socialites and heavy consumers. Food, fun, and fitness are elements of retail that are immune to e-commerce disruption. Department stores and big-box retailers are going to continue to be those hardest hit by the evolutionary process and the impact of e-commerce. 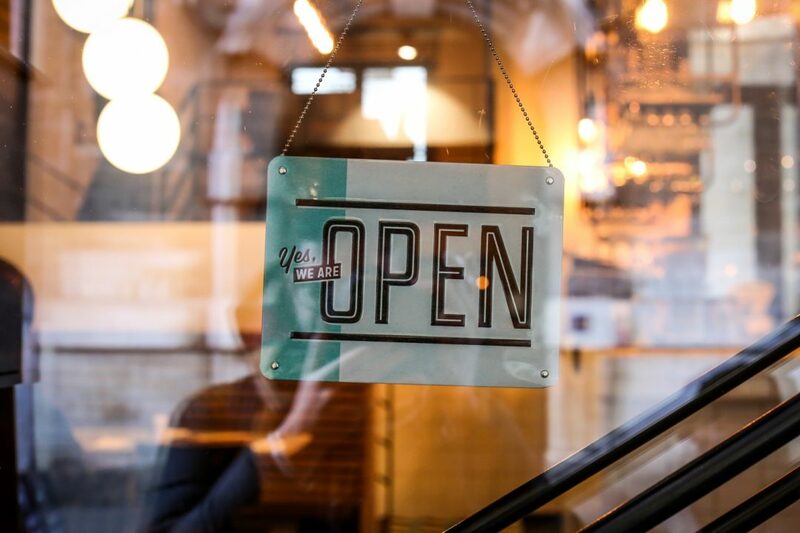 The question becomes, will there be enough retailers looking to add new locations in order to offset the impending closures. The answer, in my opinion, is no. 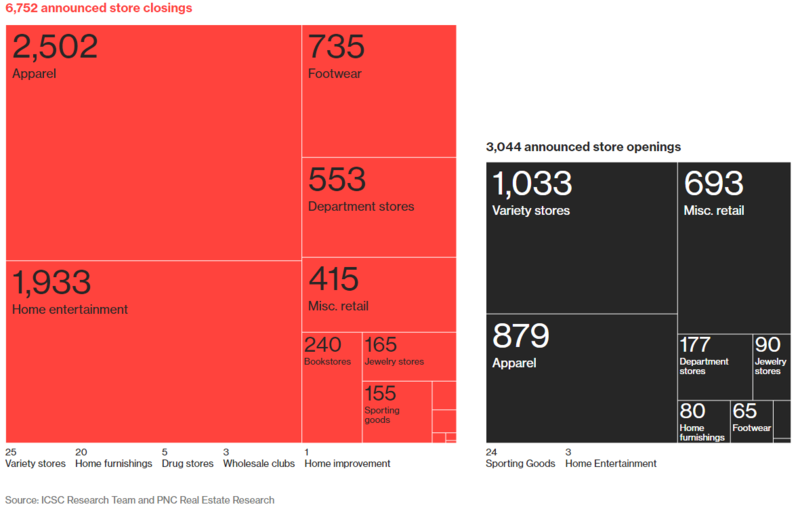 Take a look at the charts below which show that store closures nearly double that of store openings. For more on retail click here. The US as a whole has an has too much retail product, as a result, we will see much of that product becoming obsolete in the next few years as retail is reinventing itself and shedding unattractive product. The number of retailers, primarily department stores, apparel stores, and those selling commodities that can easily be purchased on Amazon are suffering the greatest number of bankruptcies. Still a top sector in the eyes of most real estate players, market fundamentals are great as the overall vacancy rate is at historic lows and unleveraged returns are double digits. The effect of e-commerce has much to do with the positive results in this sector. Net absorption over the last 5 years is nearly 1.5 billion SF, a feat that hasn’t been achieved in 20 years. Nearly 8 years into the current cycle, supply is only now catching up with demand. Rent growth has been steady and prices are at their highest levels. At this time there is a historically wide gap between in-place rents and market rents. In costal markets where demand nearly exceeds supply, we have seen rollover rents increase more than 30 percent in some cases. There is strong demand for both big-box distribution centers and small infill warehouses for last mile delivery. On the sales side, 2017 transaction volume surpassed 2016 by 25%. Not only has transaction volume increased, but so has pricing. Cap rates have fallen below 5, and the pricing for certain assets has surpassed $200 PSF. Foreign investment is pouring into this asset class like never before. This sector appears poised to continue to perform at a very high level. Multifamily will continue to yield strong results throughout 2018. I would describe the asset type as “stable” as it is unlikely to see much change from 2017. Vacancies and rents will continue to inch up throughout the year. Deliveries and new product starts are likely to remain moderate. 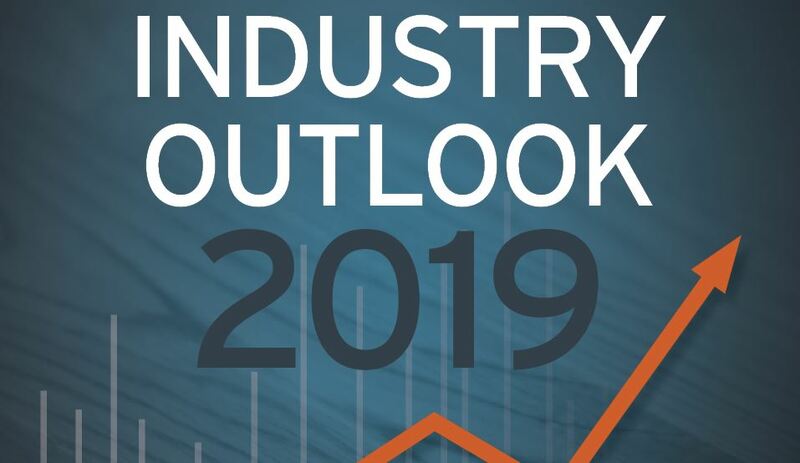 It is likely that multifamily peaked in 2017; however, supply of affordable housing in many costal markets has not kept up with demand and will thus sustain strong performance. 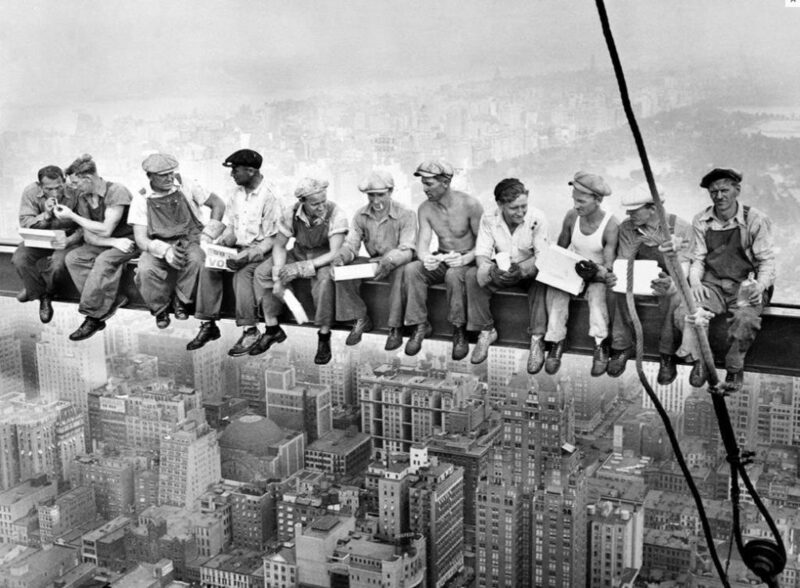 The biggest challenge facing multifamily developers is primary the cost of construction and labor. Occupancy rates have remained high in 2017 and appear to continue the same trend in 2018 – particularly in the CBD. In fact, the fourth quarter of 2017 registered the strongest quarterly occupancy growth since 2015. The tech industry continues to drive leasing activity as depicted in the chart below. Net absorption reached a two-year high at the end of 2017. The sector does face some challenges like the changing nature of work (remote workers), a growing talent shortage, leading to the expectation that vacancy rates will rise in 2018. Overall, capital is abundant. 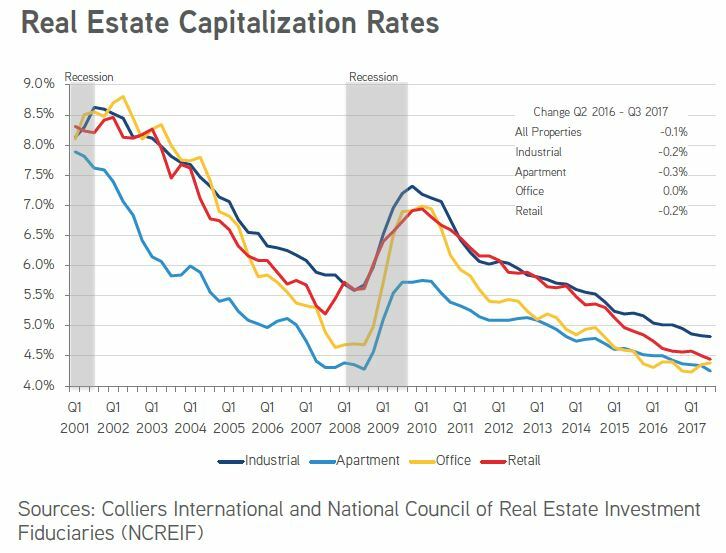 However, underwriting of CRE loans are tightening among all categories: development, commercial, multifamily etc. Foreign investment continues to increase. Foreign capital is so abundant that it is even being deployed in secondary markets – typically, foreign capital prefers gateway cities. Mortgage debt is healthy and has increased almost 4% year-over-year. Loan to value ratios have not crept up to their pre-recession norm of 70%-75%. Even in strong sectors like multifamily, in strong markets, we are seeing LTV’s between 55%-65%. Foreign investment will continue to be a major source of capital in the US. As political turmoil continues throughout the world, foreigners will look to US commercial real estate as a safe haven for their capital – even if the yield is minimal. The US is still the number one destination in the world for foreigners looking for safe investment opportunities. At this time crowdfunding still represents a sliver of overall market activity. All of the players in this space are either individuals or non-institutional entities. It is estimated that crowdfunding still represents less than one percent of transactions. REITs, in 2018, will be sellers looking to benefit from the low cap rate environment. Likely, REITs will not be heavy on acquisitions until prices become more favorable. In greater numbers, REITs are looking to add value to their current portfolios as opposed to selling and re-deploying the proceeds into new acquisitions. Investment outlook has declined recently due to property being overvalued. Yield can no longer be found in core assets in gateway cities. The amount of capital, both institutional and foreign, chasing core product in primary markets has driven up prices to absurd levels. As a result, secondary markets have are seeing an increased level of interest, just as they did in 2005-2007. Even with the growth of capital flowing into secondary markets, pricing has remained favorable. The real estate sector seems poised to have a solid 2018 – except for retail – which may struggle.